I wish I was more creative, I wish I was able to make my son a cowboy costume from a tablecloth and a selection of objects from the recycling bin but I can’t. I firmly believe in playing to your strengths and my strength is going to the shops and buying a fancy dress costume for my boy. World Book Day has been and gone and my boy went to school dressed as Where’s Wally. We think he looked ridiculously cute. The costume came from ASDA and cost us £12. It did come with a pair of glasses too but he wouldn’t wear them on the day. Like most children he loves dressing up. He loves being a superhero (I’ve no idea where this comes from as he’s never watched Spider-man in his life) and he enjoys being a fireman or policeman, but this weekend we decided to treat him to a pirate costume, again from ASDA which he is delighted with. He will often come home from school and slip on a costume and get into character. It’s a really great way to encourage his imagination and develop his imaginative play. We turn the sofa into a pirate ship and make each other walk the plank, we sail the seven seas and our decks have been well and truly swabbed. It’s great fun. I think he’d be amazed if I slipped into costume one day, maybe that’s something to think about. We’ll certainly be adding to his dressing up box in the future, you can tell by his face how much he enjoys it and it really encourages him to play. Anything which rivals screen time wins for me. I tend to get most of his fancy dress costumes from ASDA because they have a good selection at a reasonable price. Next on our list is a proper fireman’s costume. What’s your favourite fancy dress costume? Note: We were sent a costume from ASDA for World Book Day. All images and opinions are my own. 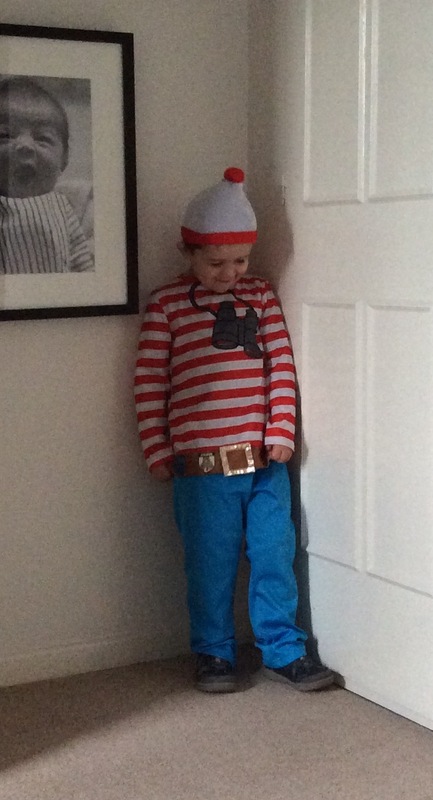 This entry was posted in Children and tagged batman, dressing up, Fancy Dress, fancy dress costumes, imaginative play, pirate, play, role play, Where's Wally. Bookmark the permalink.